A first scan through the modules that comprise Unit4’s Prosoft HRMS reads like a comprehensive list of the activities that a proactive and strategic HR department need to undertake in a technologically-transforming business. Some functions can and should be pushed to employees for self-service, while others, such as integration with existing systems (ERP and Finance platforms, for example) remain with HR – but have the repetitious and resource-consuming tasks removed and automated. Having operated in the geography for over 30 years, Unit4 is the solution that companies in APAC turn to first when considering deploying an HR management platform. The nuances of China, Malaysia, Singapore, and Australasia are the daily bread and butter of the Prosoft HRMS system, which the company updates every two weeks, so it adapts to the changing regulatory framework of the area. 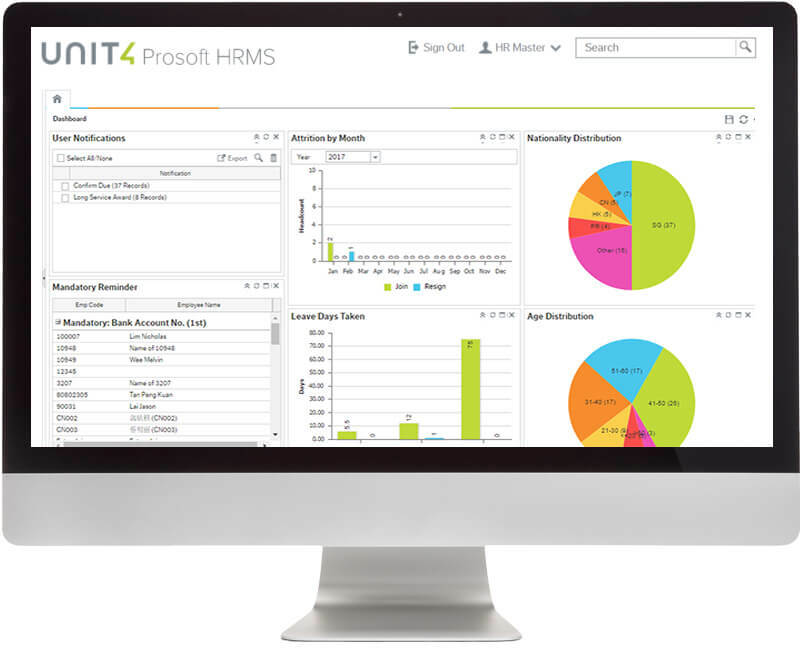 The Prosoft HRMS represents a suite specifically for HR that not only integrates with legacy systems but can also take its place among other members of the company’s applications, which help manage, plan and maintain any organization, literally from front to back office. The company’s customers come from a broad range of verticals across the world: professional services, public sector institutions & higher education, not-for-profits and many in service-oriented businesses. In addition to its larger customers, Unit4 users can be found in over 30,000 SMEs across the globe: by investing in Prosoft HRMS, you’ll be in the best of company! For the HR department in your business or organization, automating troublesome and often repetitive tasks frees up staff and drives efficiencies. Tasks like leave and attendance tracking, time management (the company even offers physical clocking devices for every setting) and time-sheeting are automated, and where appropriate are ported to employee portals, so there’s no data entry necessary in the HR offices. Staff training and on-going development – incredibly important in today’s seller’s jobs market – are handled on a personalized basis, with each staff member able to access their bespoke plan: self-taught, one-to-one, group learning, exams and certifications are all handled by the Prosoft HRMS platform. Staff appraisals are also integrated into the employer/employee relationship cycle, offering unique opportunities for monitored feedback and dialog. Staff will be involved and empowered by the Unit4 platform, so the positives spread right across the organization (and are not just confined to the HR department). As workforce needs become apparent, HRMS presents a one-stop hiring management resource that integrates with the rest of the enterprise’s systems, saving time and money as HR proactively collaborates with colleagues who request new staff and personnel changes. There are also a host of tools for manpower planning and budgeting, so costs don’t spiral, and the company stays on track. The ethos of streamlining processes permeates Prosoft HRMS (as it does all of Unit4’s offerings, see below), as candidate data for those successfully interviewed and accepted flows into the onboarding routines of the platform. Meeting peers and colleagues, introducing line managers & supervisors, setting out responsibilities and benefits for new staff: all of this and more means that HR departments start new acquisitions on the right footing. The HR department’s digitization and streamlining maximize organizational efficiency and allow rapid response to changing circumstances. Resources’ flexible deployment means big cost savings, happier and more strategically-focused HR staff, and a wider workforce that’s on-message, engaged and productive. As standalone functions or as part of larger finance systems, multiple pay runs can be handled by Prosoft HRMS, including complex allowance and deduction structures that draw in overtime schema, hours worked or accrued, and complex tax arrangements. The GUI-based API layer of Prosoft Connect allows Unit4 customers to maintain their own inter-system connections easily (if desired). This increases the company’s flexibility and removes the significant cost that’s the bane of many platforms: the expensive cost of customization. With Unit4, you can make any legacy system interface bidirectionally via Prosoft Connect, and not have to employ costly solution architects for every change and tweak. Organizations of any size interested in digital transformation need look no further than Unit4. Its platforms, including Unit4 Business World ERP, Unit4 Prevero, Unit4 PSA Suite and Unit4 Financials have the power to transform your APAC business into a world-beater. To learn more about Unit4’s comprehensive suite of products click here for a demo. And to find out more about digitizing and revolutionizing the way you handle your most important assets, your people, click here to download a brochure.